What kind of ears are you running ? Discussion in 'Bags, Gear And Load-Outs' started by tattooo, Oct 7, 2014. Those are nice out of my price range at the moment let us know if you like them! I use a regular pwir of muffs when I shoot but would like a decent pair of electronic muffs in the future! aksavanaman Work In Progress... Supporter "Philanthropist"
I have a pair of Caldwell I like to use outdoors usually these are dead because I regularly forget to turn them off LOL. I have a heavier set of non-electronic muffs I wear indoors usually with foam plugs if there are a lot of other people shooting. The Caldwells just don't work well for me in an enclosed space. If it's really warm out I will just go with the foam ear plugs. Crappy old pair of muffs for shooting pistol indoors. Most of my shooting is shotgun and muffs mess up my mount. My father in-law gave me a bag full of plugs, the kind they used at his job (Retired now). They are reusable yellow rubber plugs with a cord between them. I cut the cord real short on each end. Use till they look dirty then soak in hot water and soap. Good as new. If I need new ones, I have a bag full just like these. tattooo and old mossy like this. Outdoor shotgun shooting,,,,,,works for me. LTB45 and old mossy like this. old mossy, my wife uses the soft plugs for shotguns as well. I didnt know that plugs had a higher NRR aksavanaman ....I am concerned with my hearing being i shoot alot, once its lost it's lost .... I stepped up to the pro ears because they had the highesr NRR of 28 while still being slim enough for the rifle shooting i do. Most foam ear plugs run in the 28-35 range depending how how well you put'm in there. When you actually squeeze and roll them into your ear (so that only about 1/4 or so of the plug is sticking out) they work very well) Most of the "normal" sized muffs are only 19-25... but that's the cheap ones of course. I have a few but my go-to lately has been electronic Caldwells with foam as a double up. Hearing is not something that comes back. I went to a lot of Ramones concerts in the 70s and 80s. Now I'm going to hang on to what I've got. The double is a bit much at times - like stage walk throughs. I pull stuff off and put it back as needed. The Caldwell batteries have a long life IF you remember to turn them off!!! OhioArcher Where's da fishes? Supporter "Philanthropist"
Howard Leight Impact Sport. They were only $50 and work really well. Adjustable volume lets me hear range commands and still cuts out gun blasts. 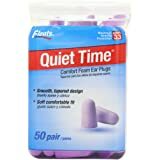 I use them (turned off) with ear plugs indoors since the sound of gun blasts seems to be doubled in the closed environment (especially .45). I also use the HL's when hunting as it allows me to pick up the smallest sounds around me. Beats blowing out my hearing aid (yeah, rock and roll, jet engines, drag bikes and dynos will kill your hearing). Thorsdaddy, VN Vet and tattooo like this.